In his 1943 classic “The Little Prince” Antoine de Saint-Exupery wrote (more poetically in French, mind you): "The flowers have been growing thorns for millions of years. For millions of years the sheep have been eating them just the same. And is it not a matter of consequence to try to understand why the flowers go to so much trouble to grow thorns which are never of any use to them? Is the warfare between the sheep and the flowers not important? Is this not of more consequence than a fat red-faced gentleman's sums? And if I know--I, myself--one flower which is unique in the world, which grows nowhere but on my planet, but which one little sheep can destroy in a single bite some morning, without even noticing what he is doing--Oh! You think that is not important!" Shepherding has expanded my awareness in many ways--shifting from a paradigm of ethical treatment of “dumb (as in mute, not stupid)” animals to an appreciation of how to make it easier for these wise animals to exercise and communicate their intelligence. As researchers found in the 1960s about humans, intelligence is contextual. In their context, sheep are far smarter than humans, who would have a rather hard time surviving, let alone thriving, if left to find their food over several hundred acres, with no tools other than their teeth. Reading about the modern shepherds of France is inspiring, not least because they are making the whole complex system work. The shepherds talk about the flock trusting them, and thus being willing to to be led. The animals, as well as the shepherds, come to know their landscape in minute detail, allowing the animals to access an amazing level of nutrition from open rangeland—better than in fenced, tilled pastures. The same knowledge and trust, applied over time, also results in improved biodiversity, fewer invasive plants, and better habitats for wildlife. So, even though my own sheep were doing quite nicely, thank you, before I started experimenting with shepherding, it is already becoming apparent both the sheep and the landscape will improve yet another quantum step as I learn how to really shepherd. At one level, it looks not unlike a combination of things I “know” how to do already: move sheep, assess pasture, identify weeds, etc. But when you put it together in the way the French herders have, it’s like moving from playing “chopsticks” on the piano to mastering a Chopin polonaise. 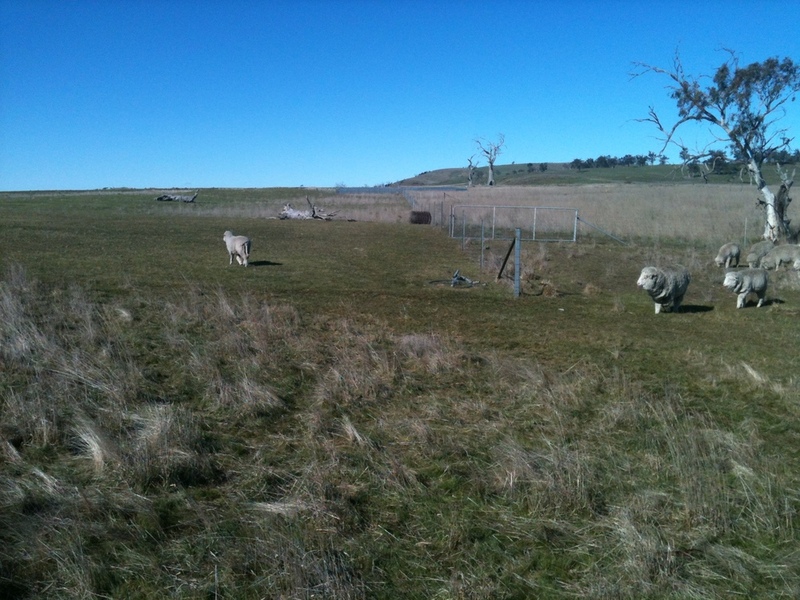 With my training wheels still firmly affixed, all I’ve been doing on the ground is 2-3 hour stints where I “ask” the flock to move into, and hopefully to graze, areas of their paddocks they might otherwise ignore. Because I have lots of fences, I can use fencelines to help me do this. In the Alps there are no fencelines. Instead there are ravines, cliffs, chasms, snowfields, forests…need I say more? “Moving” sheep for me has meant, in the past, using a tough-minded, no-nonsense dog to tell the flock where it is going, and making it do it NOW. In the spirit of trust between the shepherd and the flock, this falls woefully short of the ideal. Instead, I am learning to find and respect the biais (forward direction) the flock has chosen, and to work within it—steering, and only very lightly, rather than impelling. One over-correction too many and Old Leader will simply circle back into the flock and it may be an hour of waiting before she will emerge again to lead. Heading out with Janie and Chance. The Polaris is just to get me up the hill–from there it’s all on foot. 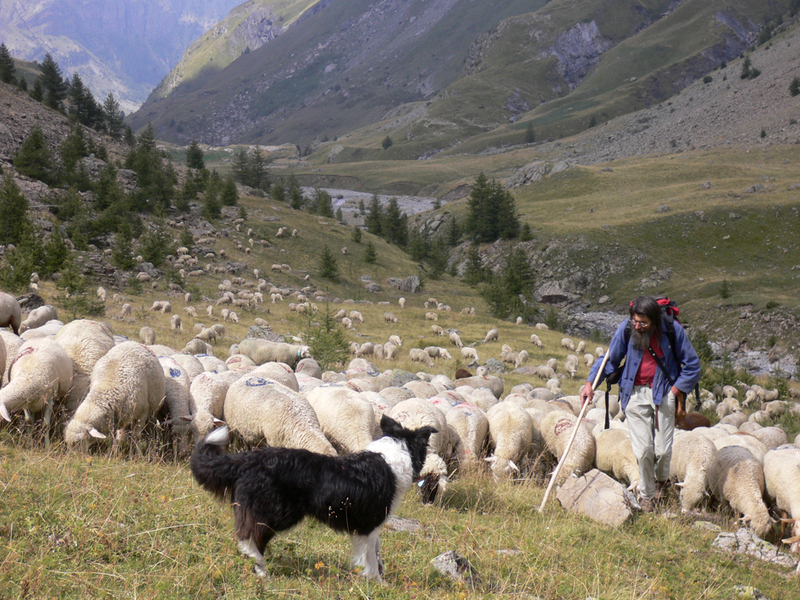 In the real world of herding in the Alps, the shepherd and flock are out on the mountain for the entire daylight period, returning to the shed or night pens only at dusk. In mid-summer, this means a 10-12 hour day, with multiple target grazing areas to be reached at specific times and in a specific order. Over the next few months I’ll be redesigning (yet again!) 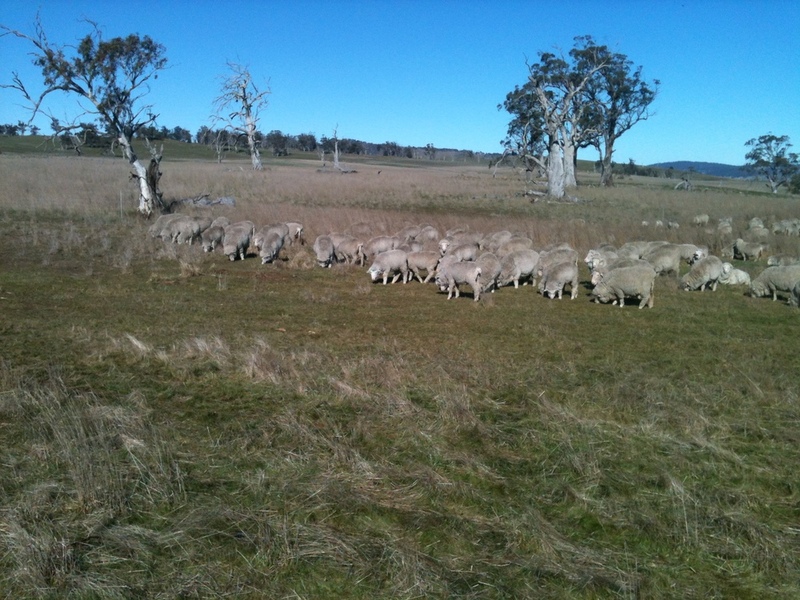 my grazing patterns to try to mimic rangeland shepherding. Meanwhile, I’ll leave you with a couple of anecdotes. The first involves Vicky Victoria, one of my pet lambs. The pets always come up to me at some point during the grazing circuit to have a little chat, then head back into the flock with their friends and relations. A few circuits ago, I was out in front of the flock, successfully slowing them down to graze more thoroughly in an area of long, coarse grass. 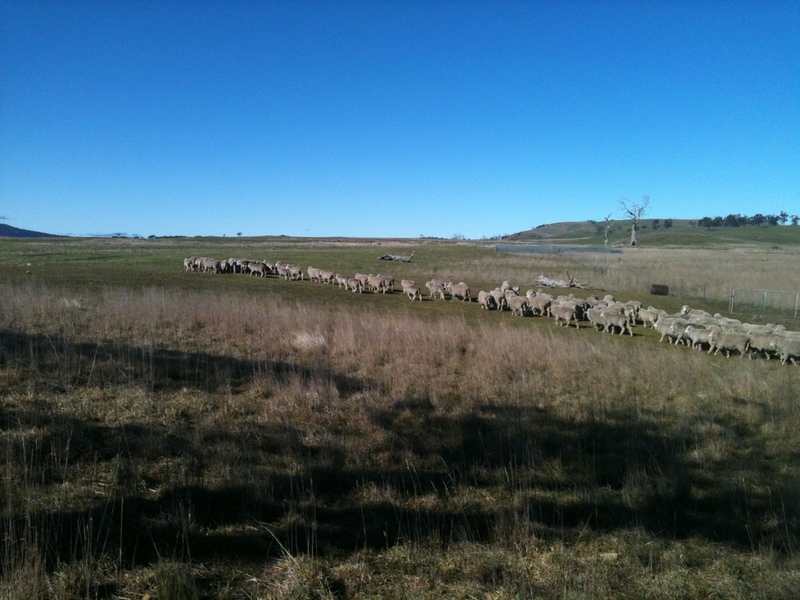 They were accepting my "blocking", though they really wanted to get past me to the water trough up ahead. I’m blocking the flock from moving to the trough off to the left of the photo. All was working well until Vicky walked into the gap, looked at me, looked at the trough, winked at the rest of the sheep, stuck her tongue out at me and sashayed straight over to the trough, as much as to say "What, afraid of her? Huh!" The mob immediately followed, and I had lost the battle. The dogs and I walked off laughing. …and the whole mob comes along! So much for my blocking. The second anecdote occurred during a dog training session. I have 5 young dogs (4 more than I should have) to train. They are all part of my “family group” of working border collies. I’ve been slow to get them into training, mostly because I didn’t know how to train them to do the style of work I want to do now, so I kept procrastinating. My own training as a trainer goes back to my days of high-precision, timed sheepdog trials. What I need now is for the dogs to have at least as much self-control as raw power, a modicum of precision, and lots and lots of patience. So I’m back in the classroom myself. Anyway, working with young Blaze, who tends to circle only one direction, I was walking backwards along the fence to block her from circling. She was pretty hyper, the training sheep were pretty stirred up, and then I tripped over the ONLY rock in the yard, and fell flat on my back in the only thistle patch in the yard. In my scramble to get out of the way of the sheep stampede, I put my hand down in the thistles as well. I’ve been picking thistles out of various bits of my anatomy ever since, and I still haven’t got them all. Too bad the little prince’s sheep didn’t eat the blasted thistle last year. The Art and Science of Shepherding book can be found here. Previous Yarns referring to it can be found here and here. p.s. Six cygnets hatched the 15th of August and are now wandering happily around the edges of Swan Lake with their parents, returning to the nest at night.